Remember those "Desktop Android" rumors? Android N has a hidden multi-window mode. Don't get too excited—this is just Remix OS. Imagine something similar, though. 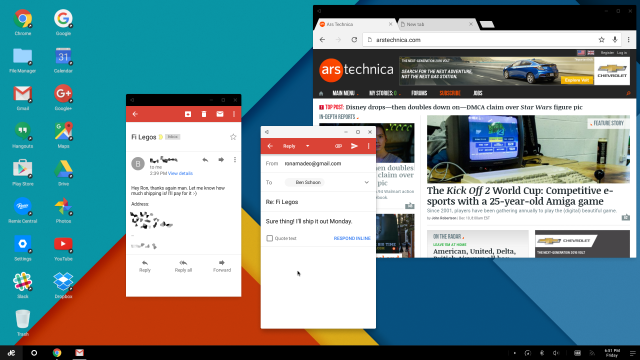 One of Android N's headline features is a new split-screen mode that lets you run two apps side by side. It's a great multitasking feature for tablets, but it looks like Google is gearing up to take things one step further. We haven't been able to get it to work, but hidden in the code of Android N are references to an "experimental freeform windows" mode. Enable support for experimental freeform windows. In the framework file, these strings are listed next to other settings in the "Developer Settings" screen, but we haven't been able to get the checkbox to actually appear. These exact strings pop up in a few other places, too, like the SystemUI and SetupWizard. The framework seems to be the main location, though. The framework also contains references for the new "close" and "maximize" buttons that a feature like this would require. The SystemUI gets in on the fun, too, with references to a "recents freeform workspace" (probably referencing the recent app list). The feature would probably look a lot like Remix OS (pictured above)—a third-party version of Android geared for desktop computers—or the multi-window mode on Samsung phones. It would have multiple Android apps on screen at a time, all enclosed in floating windows, just like a real desktop OS. >Android N's split-screen mode asks apps to deal with being resized on the fly. Once apps have that down, it's a very short jump to a fully windowed operating system. In split screen, users can already arbitrarily change the horizontal size of an app—a windowed OS would just add vertical resizing as well. Google would still have a ton of work to do with the System UI, but the app ecosystem is already quietly being asked to deal with this feature. >There's a fun symmetry here with last year's Android M Developer Preview, which contained a "highly experimental" split-screen mode. In the first release of Android M, the split-screen mode wouldn't show up in the settings until a line in the build.prop file was changed from "ro.build.type=user" to "ro.build.type=userdebug." Sadly, that trick doesn't work for Android N's freeform window mode. >As far as we can tell, making this feature work would require rooting Android N, pulling the framework-res.apk, decompiling it, opening "framework-res/res/values/bools.xml," changing the "config_freeformWindowManagement" setting from "false" to "true," recompiling it, pushing it to a device, and praying it boots. We gave this process a shot, but APKtool—an Android reverse engineering utility—can't decompile Android N system APKs without throwing up errors, so the decompile/recompile step will result in an APK that doesn't work. We can see the setting, we just can't change it. >The other option would be to compile a framework-res.apk from the Android Open Source Project source code, but there is no full Android N source code yet. Google says the code drop that came with the Android N Development Preview was "not a full platform update and only for reference." The Android M Developer Preview didn't get a full code release, either—we had to wait for the final Marshmallow release for the full source code. >Even if freeform windows mode could be turned on, it may not be working yet. Even split screen in Android N, which is enabled by default, is a crashtastic experience. Enabling freeform windows would probably result in either nothing happening or the System UI crashing over and over. Still, if someone out there manages to turn the feature on (in whatever state it is in), please let us know. >So why is Google building something like this? The feature doesn't make much sense on phones, and while it would be slightly more useful on tablets, the best use for a multi-window mode would be for a desktop version of Android. Some very reliable outlets have posted rumors that Chrome and Android will soon be Voltron-ing together to form a Google desktop OS. Telling developers that they need to deal with their apps being resized in Android N is definitely the first step toward creating a desktop OS, and this "freeform window" mode sounds like step two. There's still no information on how it works, though. Also an Android Developer Advocate, Ian Lake, said that freeform multi-window doesn't work in this release. We'll have to check in the next version.